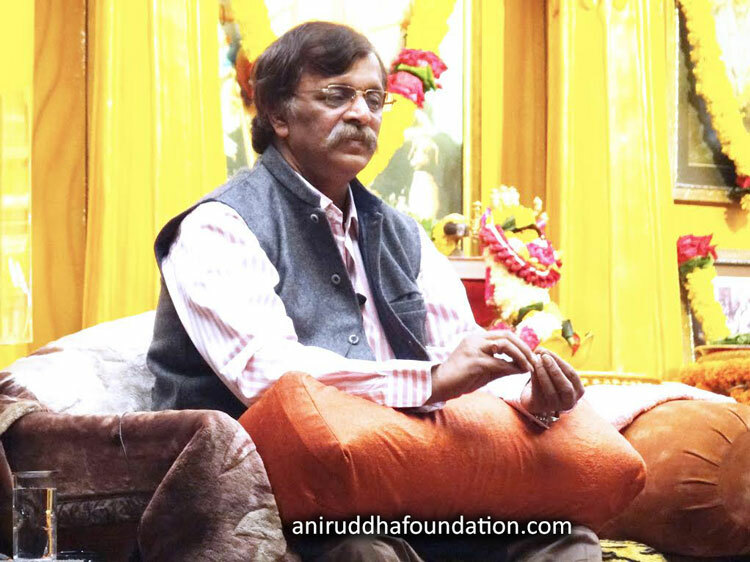 Sadguru Shree Aniruddha’s pitruvachans answer so many of the questions that cross the mind. They give the strength to tackle difficult situations and make us feel confident and taken care of. This is what every person who comes to Shree Harigurugram (The New English School, Bandra East, Mumbai) to attend Sadguru Shree Aniruddha Bapu’s pitruvachans feels. He feels it on the very first thursday that he came and he feels it every thursday there on. He can relate to the topics and the lucidity of the language, the simplicity of the explanation make it easy for him to implement all that he takes home. He not only knows what to do but also how to do it. The pitruvachan does not dwell on complex and erudite subjects. For instance, the pitruvachan based on the Vishnusahasranaam deals with one of the thousand names of Vishnu and sheds light on the special attributes of this name and all of this in a way that we all can relate to imbibe, practice and feel the goodness of it in our lives. What good is a fact that is great and admirable but has nothing to do with us common persons? Every person is entitled to know and understand the path to happiness, the path to God and the path to virtue. Worldly life never stands in the way of spirituality and the two are not mutually exclusive. In fact the first successful step towards a spiritual life is a virtuous and dutiful worldly life. The guidance that the pitruvachans offer are therefore, signposts to happiness and strength in life. A perfect family person himself, Sadguru Shree Aniruddha Bapu’s pitruvachans guide about parenting, about duties and responsibilities within the family, within a society, within the motherland and ofcourse towards mankind at large. Beginning with the name from the Vishnusahasranaam in Marathi in the first session and a name from the Lalitasahasranaam in hindi in the second session, He went on to elucidating the Ramraksha at a certain point of time. After speaking on this great work for two and a half years, he then resumed the discourses on the Vishnusahasranaam which he had explained in his first session. Also, his pitruvachan in the second session in hindi were then based on the great ‘Shree Saisachcharit’ – the work based on the life story of Shree Sainath of Shirdi and his bhaktas. Subsequently, the format of the thursday pitruvachans changed and at the moment only one pitruvachan takes place and that too in hindi. He has expounded on various subjects after this and continues to do so. The word of the Sadguru is love, it is light. The word of the Sadguru is strength, it is joy. The word of the Sadguru is the truth. Every single person among the gathering of hundreds of thousands of people at the Shree Harigurugram, feels and experiences the love of the Sadguru, the ultimate source of strength, of joy. Every single person feels the pure, well-meaning, selfless concern of this Sadguru, who calls himself ‘a friend’, a friend who never betrays, a friend who wants to see us happy. He speaks to us not just to indicate the path of welfare and well-being but he is here to take us by the hand and never let go off it, he is here to walk with us, – provided of course we wish to.